Okay, fixed. Thanks, Alan. I'll get to the other errors you mentioned ASAP. By 1960, the name, Nash, was gone. The last Nash was in '57. 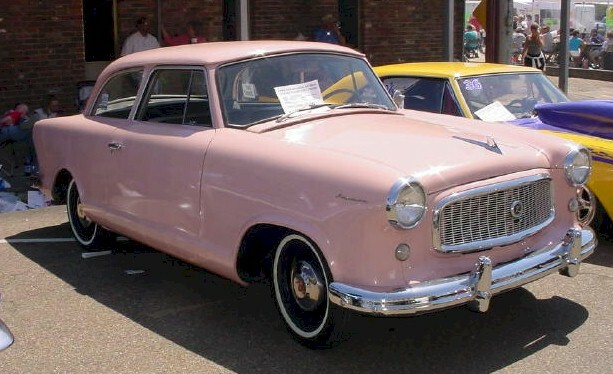 This car is a Rambler American, not a Nash. I remember that when I was 13 and a real car nut, I went to the auto show for the new 1959 models. The Ramblers on display had little beep-beep horns attached to them! Remember the song "Beep, Beep" (1958) by The Playmates? That was one of the dozen-or-so 45's that I actually owned as a kid. I guess I liked novelty records, since most of them fell into that category. Things like "Ben Crazy" (1962) by Dickie Goodman, "Ringo" (1964) by Lorne Greene, and "The Battle of New Orleans" (1959) by Johnny Horton.